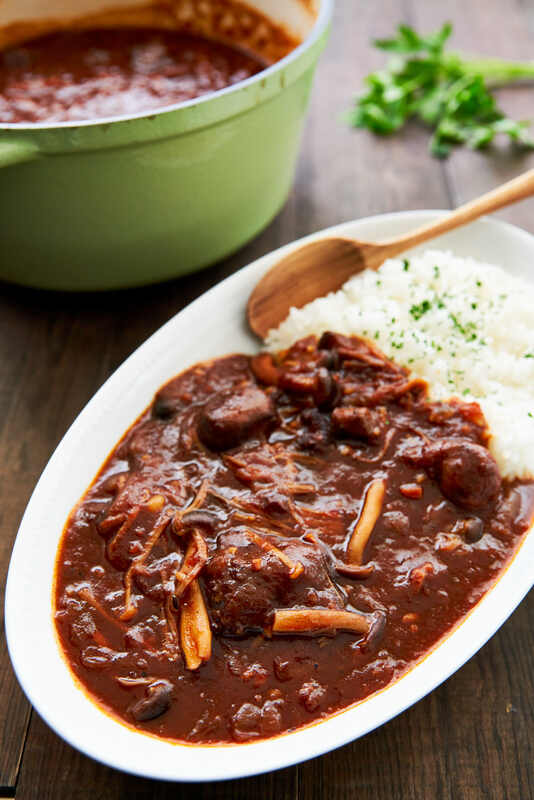 With a flavor somewhere between Boeuf Bourguignon and Sloppy Joes, Hayashi Rice(ハヤシライス) is a Japanese-style beef stew that's a family favorite in households around Japan. 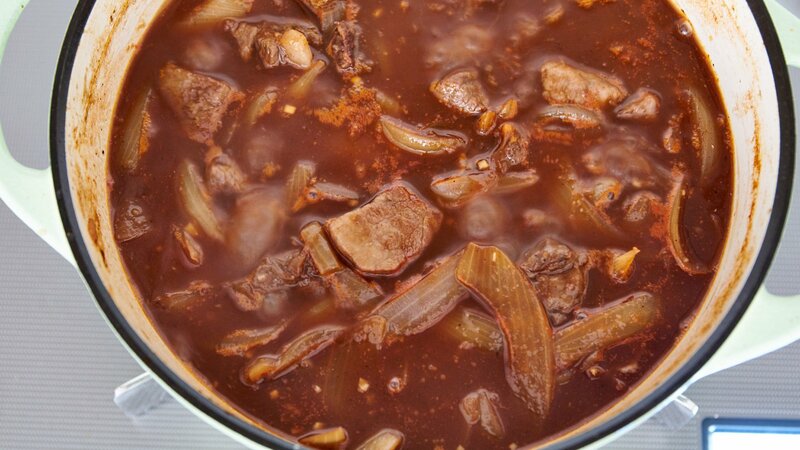 Savory, tangy and sweet, Hayashi Rice is made with caramelized onions and cheap cuts of beef simmered in red wine and tomato paste until the meat is fall-apart tender. Finished with sauteed mushrooms and served with hot rice, Hayashi rice is a classic Japanese comfort food. So how did this Western-style stew end up in the pantheon of Japanese comfort foods? Under the Tokugawa Shogunate, Japan maintained a strict isolationist foreign policy for 220 years, banning most foreigners from entering the country and barring its own citizens from leaving it. In 1854, Admiral Matthew Perry brought a swift end to this with a show of American naval might that coerced the Shogunate to sign a treaty, opening up trade with the US. By the time Japan ushered in the Meiji Era in 1868 Japan’s port cities were bustling with trade. The influx of foreigners brought with them the introduction of Western-style foods, including the practice of eating beef. These Western influenced foods, collectively called yōshoku (洋食), form an entire sub-genre of Japanese cuisine including favorites such as Tonkatsu, Hambāgu and Curry Rice. It’s unclear exactly when Hayashi Rice was created, but one creation story posits that Chef Hayashi working in a Tokyo bookstore created the dish in the 1860’s for their staff cafeteria. 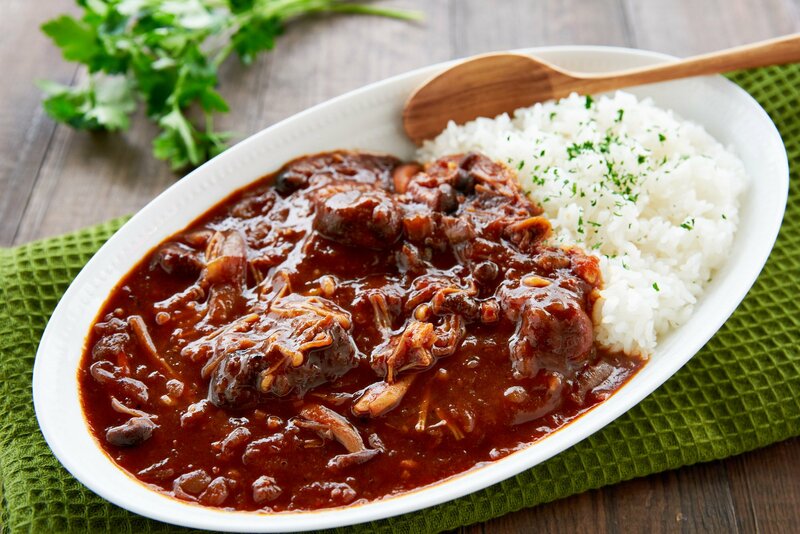 Others claim it’s a poor transliteration of “hashed beef.” In the ensuing 150 years, Hayashi Rice has gone on to become a national favorite with “instant” roux blocks being sold in any supermarket alongside the blocks for Japanese-style curry. 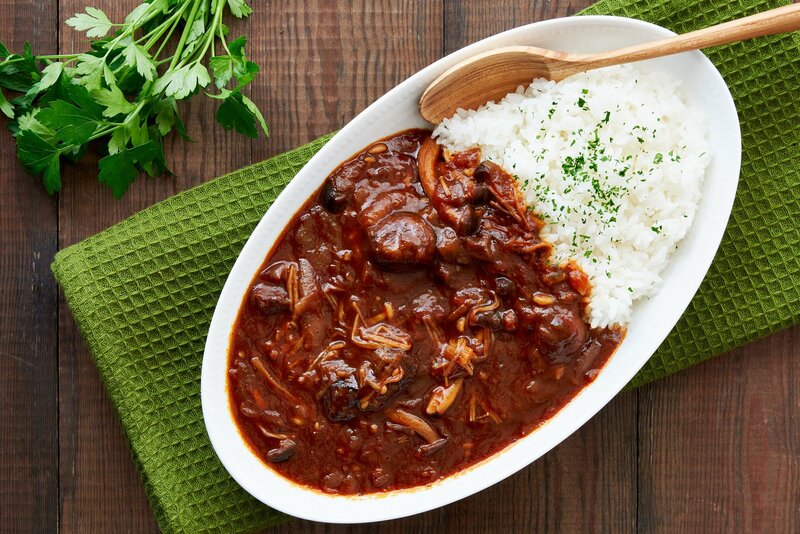 Although it has a similar appearance to Curry Rice, Hayashi Rice expertly balances its beefy richness with the tartness of red wine and tomatoes; and the savory mushrooms with the pleasant sweetness of chunou sauce and a bit of honey. This mild balance makes it a favorite among families with young kids, and because the dish is packed with umami-rich ingredients, it’s a comfort food that can be enjoyed by anyone. For my version of Hayashi Rice, I tried to stick to its humble staff-meal roots, browning cheap cuts of beef before caramelizing onions and garlic in the pot. This creates a foundation of umami-rich fond on the bottom of the pot that’s washed loose with a blend of red wine and beef broth. 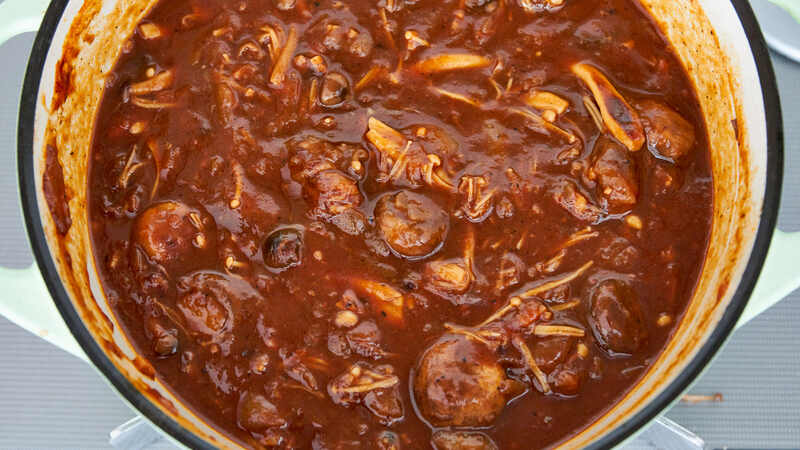 The meat gets returned to the pot along with some tomato paste, ketchup, chunou sauce and honey, which add sweetness and a mild tang to the braising liquid. In case you’re not familiar with it, chunou sauce is a sweet and spicy fruit sauce that tastes like a sweet Worcestershire sauce. If you can’t find it in your area, you can substitute tonkatsu sauce, or you can increase the amount of ketchup to 3 tablespoons and then add 1 tablespoon of Worcestershire sauce. My secret seasoning is a bit of porcini powder which boosts the umami of the dish. While it’s worth adding, to take this Hayashi Rice to the next level, it isn’t mandatory as you do get a fair amount of flavor from the mushrooms added at the end. 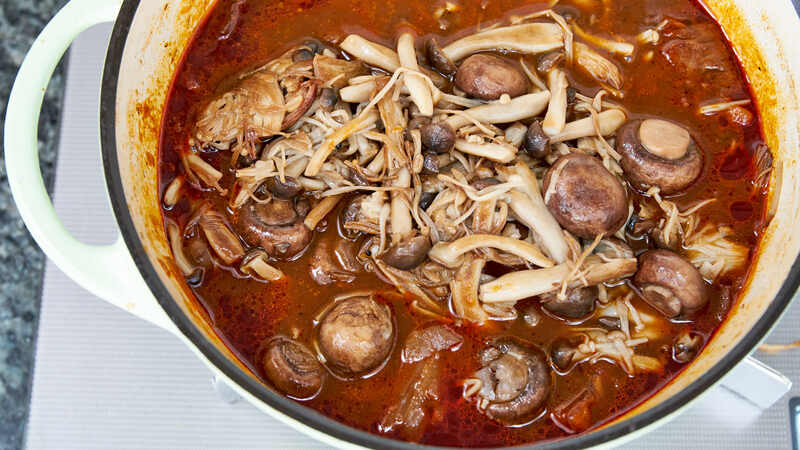 I used a mix of crimini, shimeji, and enoki mushrooms for their blend of taste and texture, but you can use any mushroom you like. After trying Hayashi Rice many ways, I’ve found the best way is to saute them and add them in at the end. This maximizes their flavor while saving them from being boiled into flavorless rubbery buttons. A bit of roux added at the very end thickens the braising liquid just enough to turn it into a rich gravy, that’s perfect for eating with rice. 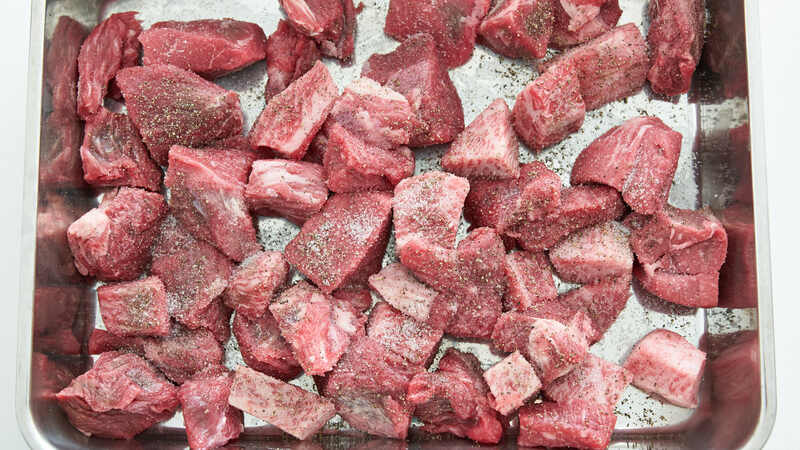 Sprinkle the beef with the salt and pepper. Heat a dutch oven over medium-high heat until hot and then add the olive oil. Swirl to coat the pot. In two batches, brown the beef on one side before flipping and browning the other side (about 3 minutes per side). Be sure you don't overcrowd the pot, or they will not brown properly. Turn down the heat to low and then add the onions, garlic, and water. 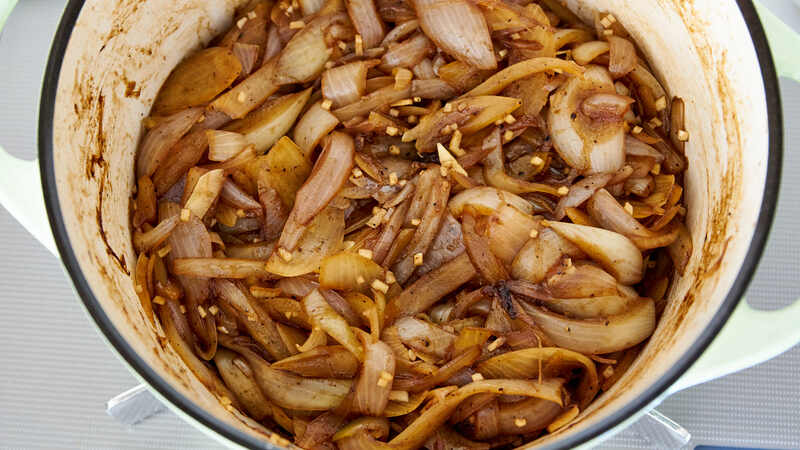 Cover the pot with a lid and steam the onions for 10 minutes, or until tender (be careful not to burn the onions). Remove the lid, turn up the heat to medium, and saute the onions until very soft and caramelized, about another 10 minutes (they don't have to be fully caramelized). Add the beef stock, red wine, porcini powder, tomato paste, ketchup, chunou sauce, and honey. Stir to combine and bring to a simmer. Cover and turn down the heat to maintain a gentle simmer. 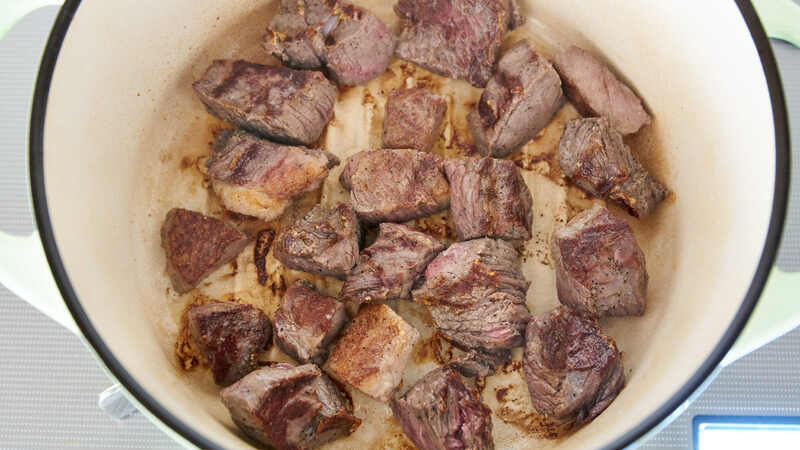 Cook until the beef is tender (about 2 hours). While the beef is cooking, trim and prepare the mushrooms. 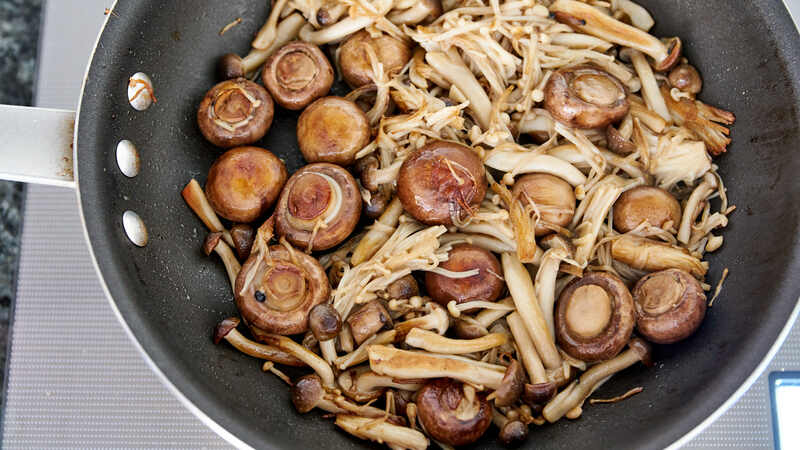 Melt the butter in a frying pan over medium-high heat and then add the mushrooms. Saute until well browned (10-15 minutes). When the beef is tender, add the sauteed mushrooms to pot. To make the roux, add 1 tablespoon of butter and 1 tablespoon of flour to a small pan and cook over medium heat until the flour is just starting to brown. Put the roux in a ladle and add some of the braising liquid from the pot. Whisk to dissolve the roux and then stir it into the pot. Serve the Hayashi Rice with rice.